TheBlueGuerilla: Halloween Special: Jasmine Rahman Vs Tory Youth Exec. Halloween Special: Jasmine Rahman Vs Tory Youth Exec. 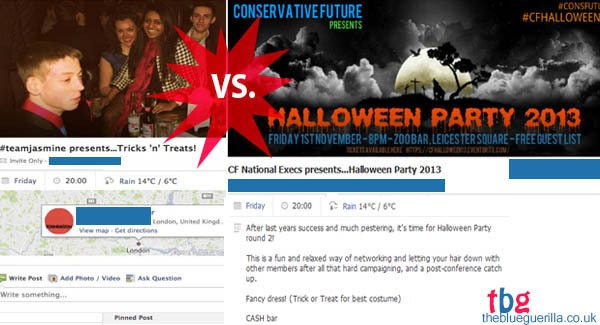 CONSERVATIVE FUTURE (CF) National Executive Halloween party at Zoo Bar in Leicester Square is set to go head-to-head tomorrow night with popular Tory activist & former 2013 CF National Deputy Chairman candidate Jasmine Rahman, who is holding an invite only Halloween party at an exclusive Central London location, tbg can reveal. Both blockbuster party's have been organised for some time and CF'ers up and down the country will be in attendance, but at which party? A decision that is sure to draw lines in the dusty CF sand. 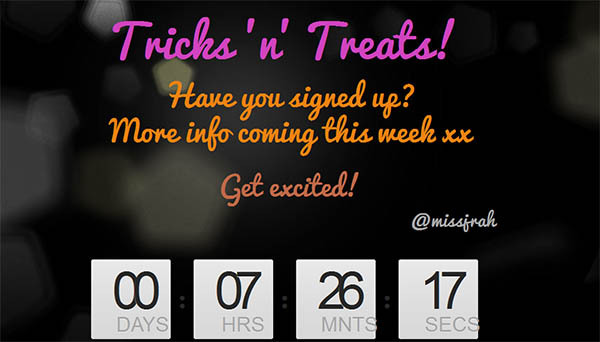 Tomorrow also marks the day Rahman's website clock ticks down to zero - spooky. tbg has heard rumours that Rahman will sensationally defect to UKIP tomorrow night at her anti-CF National Executive Halloween party, many though would say otherwise. Other rumours circulating include the CF National Chairman - "Oliver Cooper appears to be sacking off the official party to go to Jasmine's, in light of recent Sarah-Jane Sewell's revelations, that she's planning to oust Oli come next election" - one CF insider told tbg. An anonymous CF'er told tbg that the parties are only "2 minutes away from each other" and Tory Youth members are likely to be juggling the two premium events. There were already CF activists weighing up options this afternoon when one stated from a small corner in the Red Lion on Parliament Street - "The official party has free entry but cash bar... Jasmine's has free entry, free drinks all night, magician, nibbles..."
I've decided to go after SJ disgracefully appeased Union protests on her campus. Is Jasmine, single again? Please say yes! Is it true Harry Chitty has convinced Jasmine to run again? SJ OUT. Is this what it has come to? Who is going to what night out!? Honestly! Cooper is going to the official party but his girl is going to Jasmine's. #Scandal. Jasmine CEMENTS her status as the best thing that has ever happened to CF. anyone who didn't vote for her must be gutted! We love you little Tory totty!